Would you like your photo shared in our weekly bulletin? Send us your photos that represent current backcountry conditions in the Adirondacks. Send in your photos with your name and photo location/brief description to Info.R5@dec.ny.gov or simply tag #NYSDEC on Instagram. Weather forecasts and conditions can and do change quickly. Check the current National Weather Service Forecast and be prepared for the forecasted conditions or change your plans. Varying trail conditions: Ice is still present on all trails in middle and high elevations. Carry crampons on all hikes. Plan to encounter a mix of mud and ice at lower elevations. There have been many ice related accidents reported on trails and mountain slopes. Please heed ice warnings to ensure your safety on all trails. 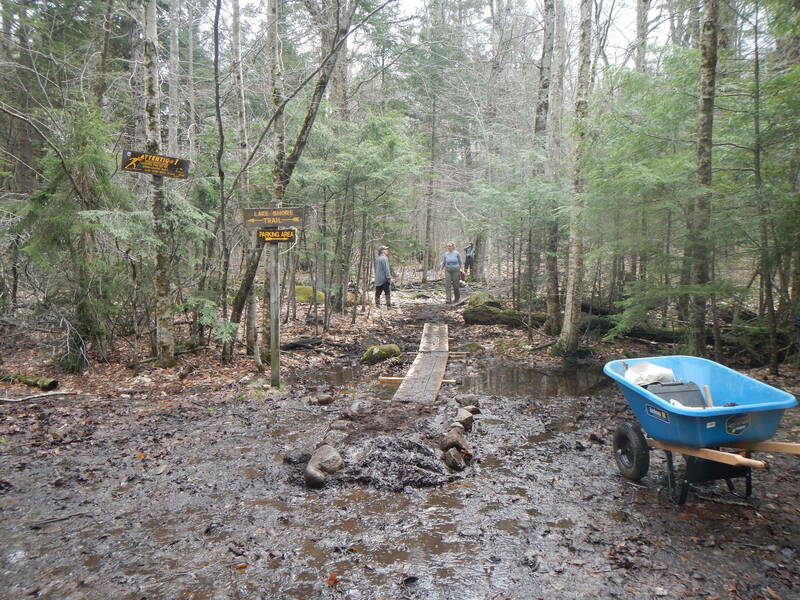 Mud: With warming temperatures at low elevations, trails have begun to muddy. Walk through the mud, not around. This will avoid widening the trail, trampling trailside vegetation and help to protect fragile wildlife habitats. Wear waterproof hiking boots and gaiters to ensure comfort and safety while hiking through mud. Emergency Situations: If you get lost or injured; keep calm and stay put. If you have cell service, call the DEC Forest Ranger Emergency Dispatch (518-408-5850). Stay warm and dry by separating yourself from the wet snow with a thicker layer on the ground such as your pack. Protect yourself from the elements by building a shelter with items around you and in your pack. Use a space blanket for extra warmth. Properly prepare to better ensure a safe and enjoyable winter recreation experience. Layering for spring-like temperatures: Temperatures at the trail head will vary from temperatures at your destination. Higher elevations and exposed summits can have significantly colder temperatures than the base of the mountain. Pack extra non-cotton, wind protectant layers and be sure to use them once exposed or feeling colder to help prevent hypothermia. Paddlers: Always wear a personal flotation device (PFD) (PFD’s are required before May 1st). Water temperatures are cold. A person in the water can quickly lose the ability to keep their head above water. Use caution entering and exiting your canoe or kayak. Expect high water levels and swift currents. Research your trip ahead of time and heed any high-water warnings or advisories for select paddling routes. Watch closely for trees, branches, rocks and debris both above the surface and underwater. 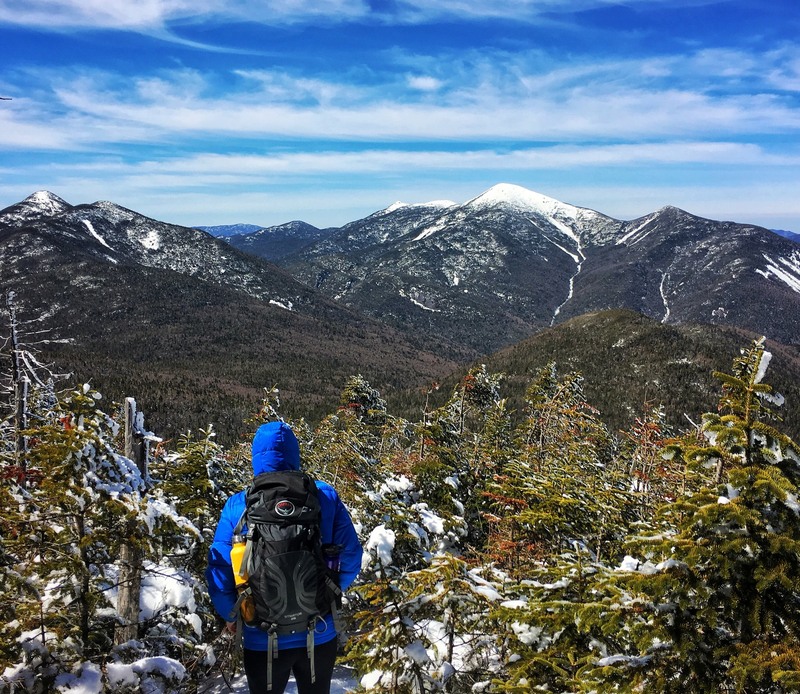 Follow proper trail etiquette to maintain minimal impact on the environment and the natural resources of the Adirondacks as well as ensuring an enjoyable outdoor experience for all visitors by following the Seven Principles of Leave No Trace. As snow next to the trails melts, compacted ice in the center creates “monorails.” Monorails can be tough to traverse. Take your time, use crampons and other traction devices for walking directly on the monorail. This avoids post-holing in trailside snow and trampling fragile vegetation and wildlife habitats. Leave rocks, plants and other natura l objects as you find them. They are most likely habitats for wildlife. Do not collect birds, eggs, or feathers. Leave the area as you found it. 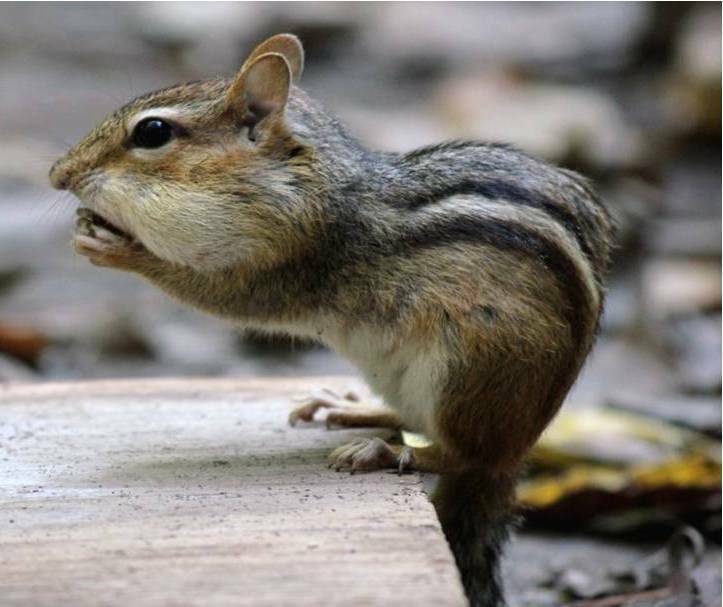 View wildlife from a distance using binoculars or a spotting scope to observe the natural behavior of animals. It’s safer for wildlife, especially vulnerable populations like young animals, breeding and nesting birds, and wintering raptors. Do not feed wildlife. Feeding can create dependence on humans and increase disease in wildlife. This includes food scraps along trails such as orange peels and apple cores. Carry out all food scraps. Spring Conditions Down Low, Winter Conditions Up High: Mud is prevalent in the lower elevations (below 1,500 feet), but snow and ice may be encountered sporadically especially in wooded areas, on north facing slopes, and other shaded areas. A mosaic of snow, ice, and mud are present in the middle elevations (1,500 to 3,000 feet) again with more ice and snow in the wooded areas, north facing slopes, and other shaded areas. Ice is present and snow is deep in the higher elevations (above 3,000 feet) and very deep in the highest elevations (above 4,000 feet). See the NERFC Snow Page for current snow information. Cool and Wet Weather: Rain and snow showers are forecast through the weekend with daytime temperatures in the 40s and 50s and nighttime temperatures in the 30s. Wear rain gear and layers on non-cotton clothing to stay warm and dry. Low elevation (below 1,500 ft) trails contain mud and water. Wear proper foot wear and carry trail crampons (microspikes) on all hikes. Walk through mud and water to avoid post-holing in trailside snow, trampling vegetation, and eroding trails. Middle elevation (1,500 to 3,000 ft) trails will contain variable conditions of mud and ice. Compacted snow has turned to ice creating “monorails” on the trails as surrounding snow melts. Wear proper foot wear and carry trail crampons (microspikes) on all hikes. Walk on monorails and through mud and water to avoid post-holing in trailside snow, trampling vegetation, and eroding trails. High elevation (above 3,000 feet) trails are icy as compacted snow has turned to ice. Carry crampons and snowshoes and use when warranted. Climbing or mountaineering crampons may be required in some places. Water Levels and Temperatures: Heavy rain and melting snow has raised water levels. Rivers and streams are flowing high and fast. See the USGS Current Water Data for New York for stream flow of selected waters. Stream crossings may be dangerous or impossible. Water temperatures are very cold. Wear a Personal Flotation Device (PFD, aka Life Jacket): People immersed in cold waters can lose the ability to think clearly and move quickly after only a short time in the water. Anglers fishing from shore or wading should wear a personal flotation device. Boaters and paddlers are required to wear personal flotation devices until May 1. Ice on Ponds & Lakes: Most ponds and lakes are still covered in thinning ice – except near inlets, outlets, and docks and along shorelines. Ice is thin and dark on most waters – no ice is safe at this time. Notices below reflect recent changes in conditions and recreation infrastructure work completed by DEC and its partners. Northville Boat Launch: The unpaved Northville Boat Launch Parking Area on State Route 30 is closed for mud season. The boat launch and parking area will reopen once the parking area has dried and hardened, and any needed repairs and maintenance are completed. Currently there is open water by the boat launch but Great Sacandaga Lake is still covered with ice. Fishing is prohibited in the open water by the boat launch until May 5. Rock Climbing Route Closures: A number of rock climbing cliffs and routes in the eastern Adirondacks are closed to climbers to allow peregrine falcons to mate and select nesting sites. Once nest sites are identified DEC will reopen routes that will not interfere with nesting activities. Rock climbers are urged to be cautious and observant while climbing in other locations and report any aggressive or agitated peregrine falcon behavior to the DEC Wildlife Office at 518-897-1291 or Info.R5@dec.ny.gov. DEC appreciates the continued cooperation of the climbing community for avoiding closed routes, volunteering to observe nest sites, and reporting peregrine falcon activity. The AIC features 3.6 miles of interpretive trails on its 236-acre property, along the shoreline of Rich Lake and Rich Lake outlet. Trailheads are located at the AIC building and are open daily from dawn to dusk.